Hi! I'm Rebecca,my family and I live in the Upper Peninsula of Michigan. Last summer we got our first flock of chickens from an older farmer who had too many. WE LOVE THEM. We love eggs, and even though the chickens are older, they still layed enough eggs for our family of four. this winter quite a few of them died, so we are trying our hand at raising replacements. They are growing so fast, and they are so darn funny! 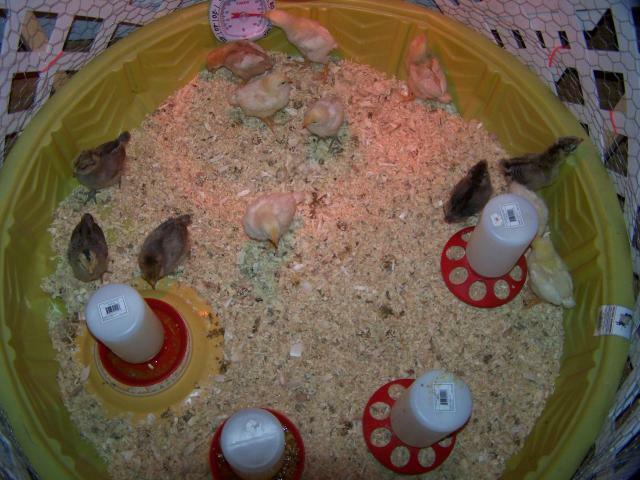 I like to think we are doing a good job, we haven't lost any chicks, and they seem so happy and healthy! I now am tempted to try and incubate some eggs from my browns but, I have to make an incubator first, so I guess that is my next project!! so we wrapped chicken wire around it and zip tied it together. 1 x 2's under the garden steak to keep the light from wobbling. 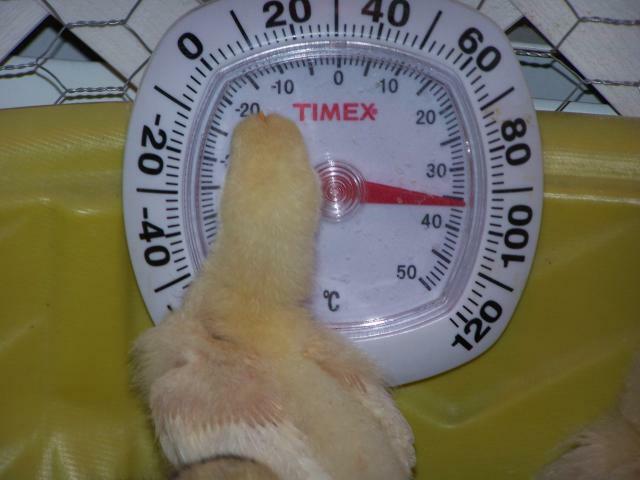 i hung a thermometer near the floor to keep track of the temp, put in the feeders and water fountains, pine shavings, chicks! they seem to be really happy! they have plenty of room to move and play. and that just adds to their social life. the kids hold them and they are really used to us being around. but the cats don't bother it, the chicken wire we used is 36" tall, and that seems to be enough. under 20 bucks, and about 30 minutes of my time. We have friends in the UP, absolutely love the people and how beautiful it is there!! Thanks for the post gave me a good idea about the fencing to put around it. huh how do you keep the brooder from smelling? We had a brooder and it stunk matter how many times we cleaned it! I like this one too! Could put up roofind felt on the sides if needed for drafts. Oh, and if you put ducks in it, make sure you tape up any cracks.....those ducklings really make a mess!! MicheleRoe - I think the really close lamps are using regular incandescent bulbs instead of infrared heat lamps. I've used a normal 100 watt bulb with no problems in the past but I did have to put the lamp pretty close the first week or two. This is just what I was looking for. Going to repurpose the kids' play pool for a bit! Thanks! Great Idea!!! I'm from S.C. and that does not look redneck to me! ;o) It looks thrify! I notice your lamp is about the same distance as mine. 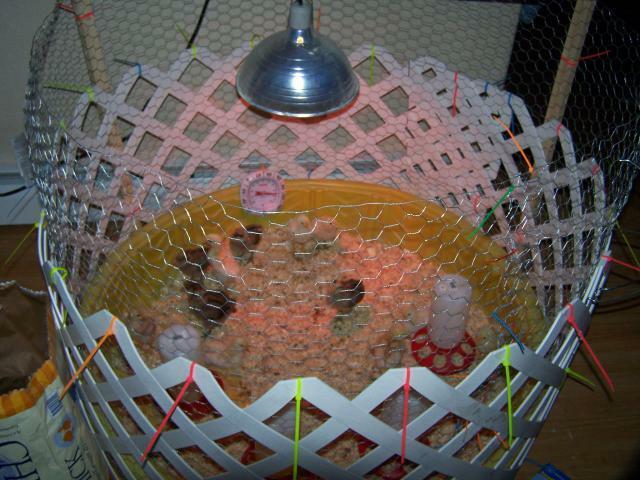 Are your chicks indoors? 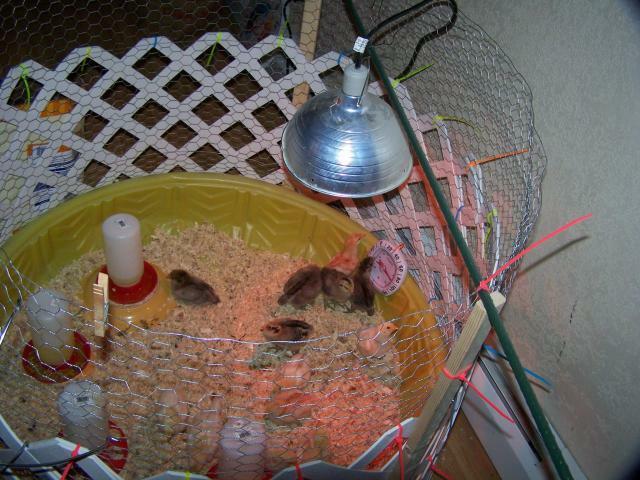 I just noticed in some of the pics that the lamp is only about 12" -18" from the chicks. Just seems close to me. Especially if mine are indoors anyway. Too cute, I want one.